Very clean, very gentle. Really good spa. Dishes from main menu are good. Everything else was excellent. Especially the breakfast. I liked all the stuff being nice to us, the breakfast and the spa was very good. I liked the time saving opportunity to buy Bansko lift carts at the reception at no additional cost. Very convenient option. 1. Nice buffet, 2. You have great equipped kitchen, 3. Nice SPA. Comfortable room, beautiful swimming pool, fitness room, relaxation room, sauna, room for small children, restaurant, children play garden, change machine - everything was perfect and suitable for comfortable family vacation. I liked the SPA center - it was renovated, clean and wasn't crowded - the indoor pool was amazing! Also I have to say that the breakfast was one of the best I've had in a hotel - multiple options to choose from and high quality products. The staff was very helpful, although when we checked-in it was very chaotic as lots of people were checking-in at the same time. A very lovely hotel with an extensive spa area available for free use. Wonderful breakfast included in room rate. Great kids amenities and beds were extra comfortable! The spa and pool were great. The restaurants in the hotel were Excellent. Staff was friendly and professional. The breakfast was rich. There is everything you can think of. The staff was very polite and helpful. The rooms were extra clean and the bed really was like a cloud. Our stay was really amazing! Lock in a great price for Lucky Bansko Aparthotel SPA & Relax – rated 9.2 by recent guests! 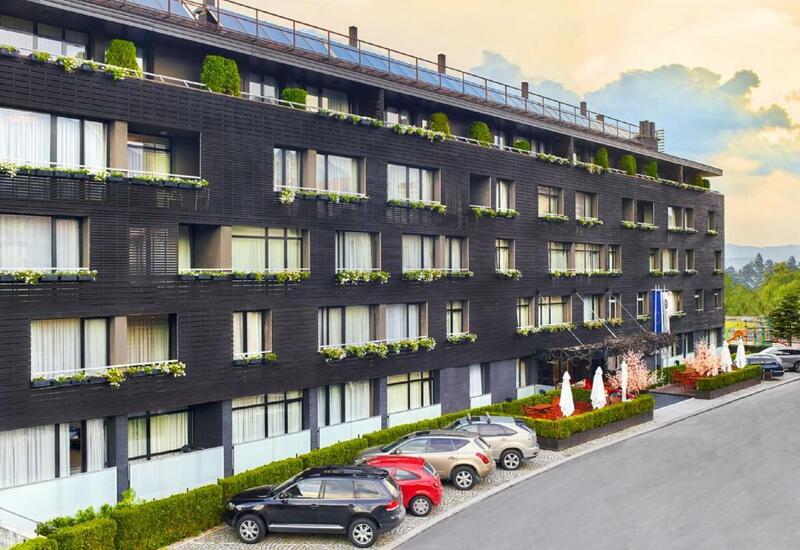 Lucky Bansko Aparthotel SPA & Relax This rating is a reflection of how the property compares to the industry standard when it comes to price, facilities and services available. It's based on a self-evaluation by the property. Use this rating to help choose your stay! 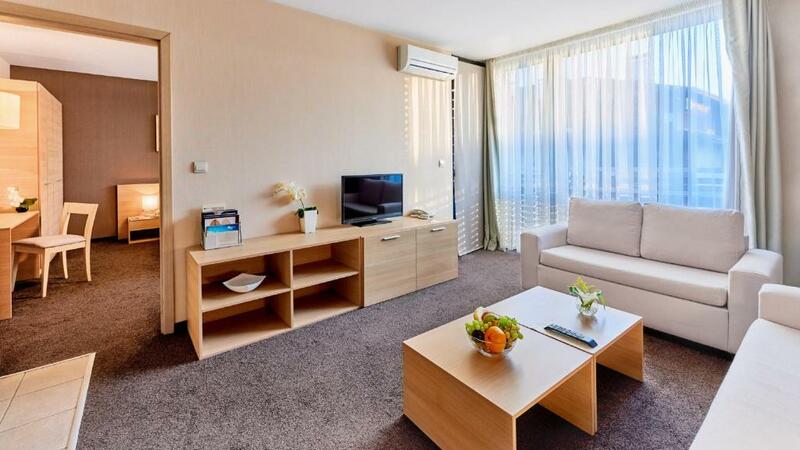 The luxurious Lucky Bansko Aparthotel SPA & Relax offers spacious apartments and studios with free WiFi access. The spa center offers free of charge an ice room, a steam bath, a hot tub, contrast showers, a fitness center Technogym, indoor bio pools with 33°С temperature, a pool with Dead Sea salts and a relax room with Himalayan salt lining. 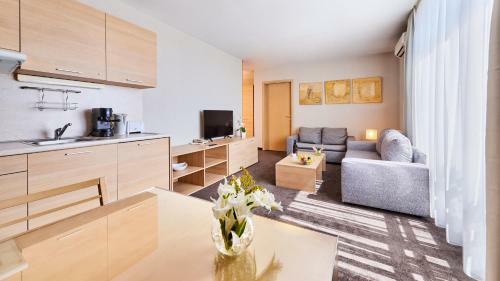 All units have a fully equipped kitchenette and bathrooms with French cosmetics and bathrobes for adults and children. The Lucky Bansko Aparthotel SPA & Relax houses 3 restaurants, serving traditional, Italian and alpine dishes, made from original recipes. The Italian restaurant is part of the Aqua Complex of the hotel. In this complex, guests find swimming pools for adults and children and also different entertainment options and attractions at a surcharge. The spa offers a variety of treatments and therapies, including ultrasonic peeling, RF face and body lifting, and anti-aging treatments with the high-quality French cosmetics of Academie. A children's playground and club are available. Through the winter season professional babysitters care free of charge for the children in the kids club. Lucky Bansko Aparthotel SPA & Relax offers 3 exclusive programs during the summer: LuckyFit - for relaxation and weight loss and LuckyKids - language camp for children with English lessons and Ayurveda Clinic Lucky Bansko - healing, rejuvenation and detox. The hotel organizes excursions to cultural sites and monasteries in the area. In spring, summer and autumn, mountain trekking hikes are organized free every Thursday and Saturday, with mountain guides. During the active ski season rates include free transportation to and from the gondola station, every 15 minutes from 07:45 until 10:30 and from 14:00 until 17:30, as well as every 30 minutes from 10:30 until 12:00. A free evening shuttle to and from the center of Bansko is also available. When would you like to stay at Lucky Bansko Aparthotel SPA & Relax? Spacious room with wardrobe, kitchenette, table with TV; bathroom. One extra bed is possible. Consists of a bedroom, a living room, a bathroom and an anteroom. The bedroom is furnished with a king bed, a wardrobe and a TV. In the living room there is a fully equipped kitchenette, 1 sofa and 1 sofa bed, 3 small tables and a TV. These apartments offer all standard features, plus the comfort of extra space. Two people on regular beds and up to 2 people on the sofa bed. The apartment has a living room with kitchenette, sofa bed for 2, 3-seat sofa, TV, balcony, bedroom, wardrobe, and a dressing table with a chair. Has a living room with balcony, kitchenette and dining table, TV, 3-seat sofa and fireplace. The double bedroom comes with wardrobe and second TV. 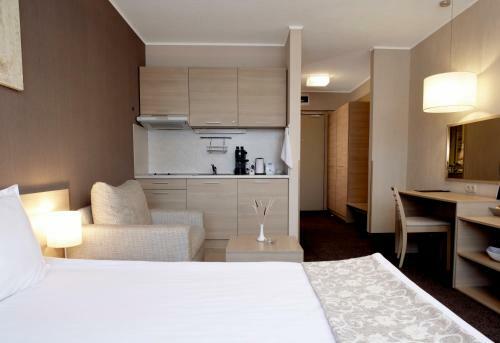 Spacious room with wardrobe, kitchenette and satellite TV. A private bathroom with slippers, bathrobe and free toiletries are also available. This air-conditioned suite has satellite TV, a seating area, a balcony with outdoor furniture and a private bathroom with a bath. This apartment features a balcony, toaster and seating area. This apartment has a kitchenware, toaster and bathrobe. What makes this hotel unique? It is the wide variety of programs developed by the hotel, programs that enjoy great popularity and success: LuckyFit program to help you lose weight, children's language camp LuckyKids and the ayurveda treatment program for treatments and detoxification. The latest, which will delight the clients of Lucky Bansko is a beautiful new Spa & wellness center that will be opened on the 20th of December 2016. In the new Spa & wellness center there will be new therapies that are not available anywhere else in Bansko, such as applications with healing mud or micronized algae, hydro therapies combined with tangentor bath tub, therapies based on nanotechnology with almost instant rejuvenating effect on the skin. The treatments are various with high quality and are designed for women, men and children. The hotel offers excellent conditions for corporate events with modernly-equipped conference hall and three smaller halls with free Wi-Fi in the entire hotel and secured parking for all guests. The hotel is extremely comfortable for families. 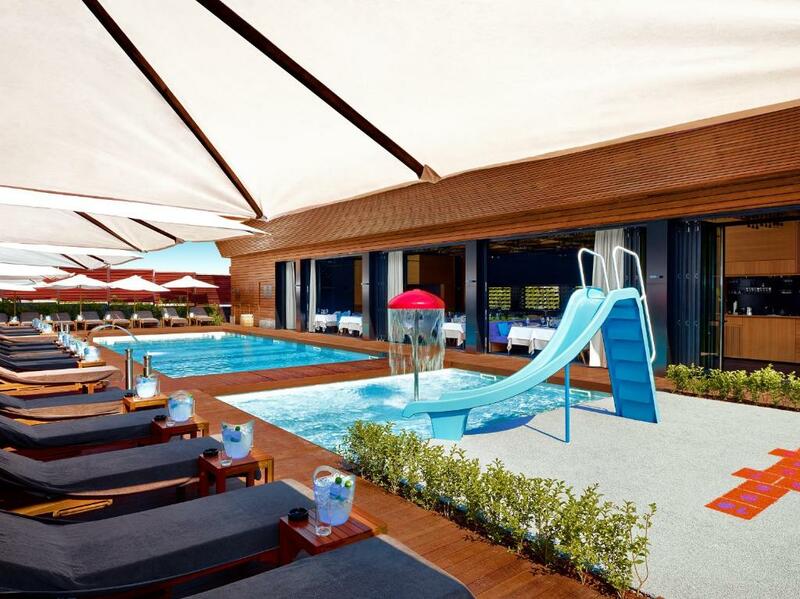 Kids club, outdoor playground with attractions and children’s accessories are available. Why us and how we are different: * We always offer to our guets excellent service and real care * Professionalism in combination with modern solutions and homely athmosphere. * We offer free wireless internet and computers - to be always well-informed. * Large spacious apartments with free accommodation for children, especially important for families. * Wonderful SPA§ Relax center. * We offer a modern conference hall and interactive technology from last generation. * We offer great programs, which makes the hotel different, relevant and wanted! Nominations of Lucky Bansko Aparthotel: •	Hotel number 1 for Bulgaria in 2016 for two of the three possible categories: "Luxury Hotels" and "Hotels with the best service" according to the ranking of TripAdvisor, •	Best hotel in Bansko for 2014 and 2015 awarded by the Portal of Municipalities in Bulgaria,www.kmeta.bg •	Top hotel in Bulgaria, awarded by TUI UK, for three winter seasons in a row 2013/14, 2014/15 and 2015/16. The location and geographic charasteristics of the territory have determined Bansko`s being populated in the earliest historical times. Multiple archeological objects, found on the territory of Bansko region, including on the territory of the city serve as evidence for that. In the ‘Staroto Gradishte’ area, 4 km south-west of Bansko remains of ancient fortifications have been discovered. In close proximity to the this area, Thracian mounds have also been found. A Medieval settlement supposedly exists in the ‘Holy Trinity’ area. The remains of the late Medieval churches of Saint George and Saint Elijah can be found south-east of the town of Bansko. House Rules Lucky Bansko Aparthotel SPA & Relax takes special requests – add in the next step! Lucky Bansko Aparthotel SPA &amp; Relax accepts these cards and reserves the right to temporarily hold an amount prior to arrival. Lucky Bansko Aparthotel SPA & Relax accepts these cards and reserves the right to temporarily hold an amount prior to arrival. Please note that the outdoor swimming pool is available at a surcharge. Please inform the hotel in advance in case of late check-in (after 18:00). 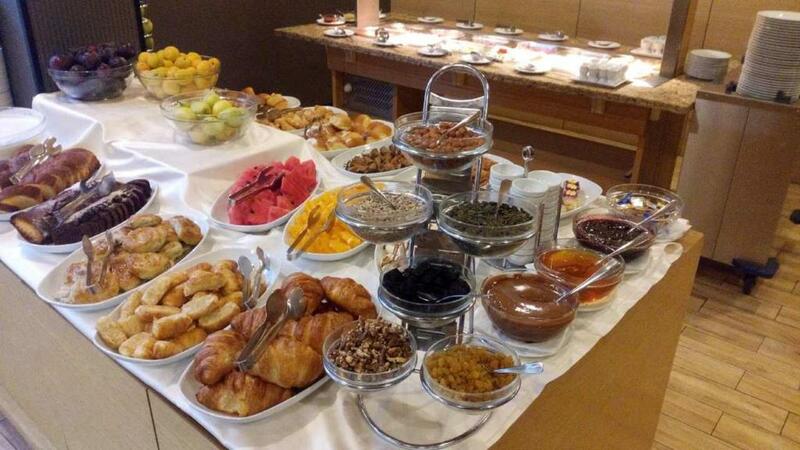 Please note that breakfast & dinner are served as buffet or as set menu, depending on the number of guests. Some rooms can accommodate an extra bed. Please note that extra bed requests should be confirmed and approved by Lucky Bansko Aparthotel SPA & Relax in advance. During winter season, the rate includes free transportation to and from the Gondola station every 30 minutes, as well as directly to the ski slope on Saturdays and Sundays at 09:30 and 10:30. During the ski season the rate includes also a free evening shuttle to and from the center of Bansko. Please note that the free mountain hikes must be booked by guests at least 24 hours in advance. The hotel is not very customer oriented or friendly. We were overcharged on two occassions (even for a water that we had never received or consumed - in a 4star hotel, you should not even argue with your hotel guests about one bottle of water) and needed to go through very unpleasant conversations. After even eaten in the Italian restaurant of the hotel, I felt poorly and had stomach problems. The breakfast was decent ( a wide variety of different food selections - buffet breakfast). The spa area with its swimming pool is also pleasant and well done. The transport system to the skiing area is good; lots of buses available so that every 15 minutes you get to the skiing lift. The rooms, suites and corridors are small and not roomy. There is no view and the hotel structure is very perplexing - there are two main buildings and the connection between them is strange. The SPA is marvellous - steam baths, saunas, pools with salty water, ice pool, salt room... The staff is very friendly and helpful. A lot of animation for kids. Good breakfast, although more is to be desired from the dinner. Nothing, you can't really get wrong with this property. 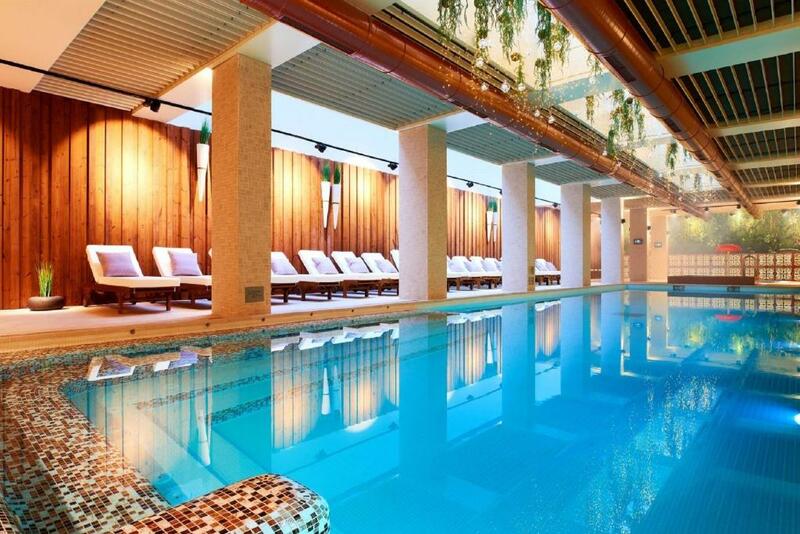 Amazing SPA and hotel and great indoor swimming facilities. Breakfast is the best I had in Bulgaria. We stayed at a family apartment and it is very spacious and well appointed. The complementary wine was a nice touch. Everything. Fantastic Swimming pool and breakfast. Kids play area was awesome, My kids really enjoyed the stay, definitely will come back. The buffet is not so tasty waiting from 5 star hotel and WiFi in rooms very poor, connections are dropped very often. Many statements written on their website are not true. The staff members at the reception ( Ms. Nelly and Mr. Dimitrev) were not polite and they charged us for the third child 60euros a day. We ended up paying much more than expected! The cleaners were nice and polite!! Wellness facilities are super. The food as well. Very friendly staff. The rooms were very small.It would have been good if there were less furnitures in the drawing room which made the clogging feel in the room. It was near to the Skiing slope. Aparthotel Lucky Bansko is excellent place for vacation, very good location, friendly staff and excellent breakfast. In one word everything is excellent. I highly recommended the hotel to others. Would be great to have a little bit more hours of transport to the city center and back. But was still very comfortable with all the ride. Great hotel with a transfer to the mountain which let you skip in the morning the Gondola lines. Also the SPA in the hotel was very good. Some games in the hotel and breakfast was nice. The rooms are starting to show their age. We have been 7 time in lucky bansko and now some rooms has scrathes in the walls, and the bathrooms are looking a bit dated. The kids at the pool area needs better supervision. Breakfast is perfect. The staff is very friendly The spa facilities are excelent The transportation to the ski resort is very nice. Breakfast was great, we had a great room full of amenities.. Great hotel, very kids-friendly, with bathrobes and slippers for kids, not to mention the free playstation and games in the playroom!! We all had a fantastic weekend. We also loved the pool, which was very warm.. You can't ask for more.. There is also an exchange-money machine in the hotel, very helpful when you're out of cash.